Last week we traveled through rural Alberta, past blonde fields of silken wheat and barley, and beside harvesters laying down bulky swaths of hay for the balers. Back home in farmers’ markets, colourful mounds of cucumbers, squash, tomatoes, peppers, and corn tempt us gardenless city folk. September is the month of harvest! The Bible is full of references to harvest. “And the Lord will grant you plenty of goods in the fruit of your body, in the increase of your livestock, and in the produce of your ground” – Deuteronomy 28:11. “You shall plant vineyards and tend them, but you shall neither drink of the wine nor gather the grapes; the worms shall eat them. You shall have olive trees throughout all your territory, but you shall not anoint yourself with the oil; for your olives shall drop off” – Deuteronomy 28:39,40. Reaping a harvest is often the metaphor Bible writers used to teach spiritual lessons. “He who continually goes forth weeping bearing seed for sowing shall doubtless come again with rejoicing bringing his sheaves with him” – Psalm 126:6. “And let us not grow weary in doing good, for in due season we shape reap if we do not lose heart” – Galatians 6:9. “Sow for yourselves righteousness; Reap in mercy” – Hosea 10:12. “Then He said to them, ‘The harvest truly is great, but the labourers are few; therefore pray the Lord of the harvest to send out labourers into His harvest'” – Luke 10:2. The memorable love story of Ruth and Boaz blossomed during harvest time (see the book of Ruth). And eat its pleasant fruits” – Song of Solomon 4:13,16. Now it’s your turn to write about harvest. Perhaps you have a harvest memory you could write about in an essay or poem? Maybe harvest time could be the setting of your short story. Is your harvest a person—the son or daughter you are sending away to school, college or university? You might want to weight the harvest imagery by introducing the theme of reaping consequences into your poem, story, or essay. When you need a break, feed your inspiration with a fresh tomato, a tart, juicy new-crop apple, or a sweet buttery cob of corn as you enjoy September’s literal and literary harvest. Very interesting–I was just writing this morning to a woman who was musing about what our names mean. Mine is a derivative of Therese–meaning harvester. I’ve made a note in my notebook to process this, find some words for the tilling that’s happening. My process is inordinately slow; often writing seeds/prompted that are planted come to fruition years, even a decades later. We’ll see what happens. This is a deep planting, I sense. 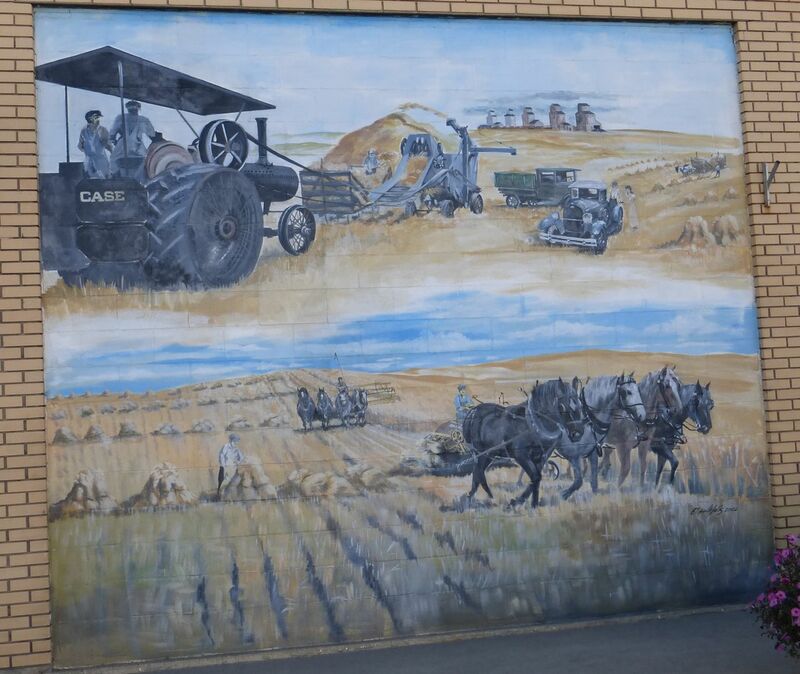 I enjoy your articles – and especially this one about the harvest time on the prairies. That was always a great time – as long as it had been a good year. Thanks, Dorothy! I’ll bet you have many wonderful prairie memories. I love going to the prairies during the fall. There’s nothing like the fragrance of the wheat harvest! What an enjoyable post, Violet. Thinking about harvest is both reassuring (in that the good work we do will one day come to fruition) and cautionary (that we must be about doing good work to achieve a harvest.) As I pull the vines down from the bean poles and stuff the squash vines into the compost bin, I’m reminded again of the work and benefits of harvest. That’s also a wonderful quote by Rilke. Definitely an entry for my quote book. Thank you.